India currently spends about 1% of GDP on healthcare. China spends about 3% and the US about 8.3%. That is about to change. If things go as per plan, Prime Minister Narendra Modi's government is planning to rollout Universal Healthcare for India beginning April 2015. The project will be taken up in phases and would eventually cover the entire country by March 2019. I have always been a proponent of Universal Healthcare. The erstwhile united Andhra Pradesh state had shown the way by implementing the dramatically successful Aarogyasri scheme where people who were below the poverty line (BPL) were given access to healthcare they could only have dreamed of in the past. Currently, of course, the number of beneficiaries of the scheme far exceed the number of people who were BPL as per the records. The scheme is being misused by people who are not the intended beneficiaries. Despite this, I would say the scheme is really good because the lives of thousands of poor people are being saved every year thanks to this scheme. The loopholes must be plugged and the scheme continued. Modi's task would, of course, be far more challenging. For starters, however, they wouldn't have to worry about unintended beneficiaries getting the benefits of the scheme. There would be no unintended beneficiaries as the scheme is not restricted to BPL people. It is for all. Some might argue that this is not wise as there was no need to subsidise healthcare for people who could afford it. While this argument holds merit in the case of the super rich, ask any middle class family with someone on a chronic condition like dialysis and you would see how medical treatment can wipe out any average family's life's savings in just a few months. The scheme is going to cost the government about $11.4 billion annually. To put this number in perspective, India spent $47.4 billion on defence in 2013. So a fourth of that for Universal Healthcare is a good bargain, if you ask me! The plan is being thought through well. Primary healthcare will continue to be offered by the Government especially in rural areas where infrastructure is going to be improved. Tertiary healthcare is going to be offered through the insurance model. The scheme includes some basic drugs and diagnostic tests free. While reaching the entire country in an effective way will obviously take decades (which is not surprising since it involves a sixth of the world's population! ), we must not shy away from this basic necessity of the people due to this. A beginning has to be made somewhere. 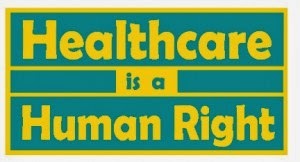 I have always maintained that access to healthcare should be a fundamental right. No citizen of the country should be allowed to suffer if a treatment is available just because he or she cannot afford it. Dr. Martin Luther King, Jr had once said, "Of all the forms of inequality, injustice in health care is the most shocking and inhuman." Let us not allow this injustice in health care to continue for much longer in our country. hi, kamal! its a great news to hear ever. I really thankful to the "Modi govt." to do such a wonderful health conscious work for the people.